As with any bold statement of fact, it's not quite true to say that I don't name my rides. I swore at the earliest cars we owned, calling them all sorts of unmentionable names, mostly when they refused to start on a particularly loathsome winter day or night. But I didn't really name any of our cars in the way that some folks name their vehicles. Not even the 1976 midnight blue and camel interior Mustang we were so proud to drive, and not even the 1990 mid-life-crisis red Miata I owned from 1993 to 2012. I did kind-of name my Vespa LX 150 though. I was trying to get up a sidewalk ramp to get to a better place to snap a picture and the centre stand hit the curb, amputating the wing on the right leg of the stand. Then and there I decided to call the scoot "peg leg". I may have mentioned it in a blog post at the time, and I don't think I actually ever uttered the name, or told anyone. So it doesn't really count. 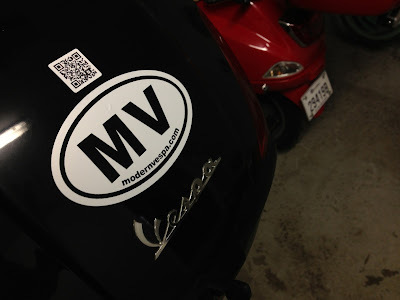 What I do indulge in, is putting Modern Vespa stickers on the bike to proclaim my allegiance to the Modern Vespa forum. There is now one on the legshield at the front, and one on the topcase at the back. The MV stickers look like a country identification sticker. MV is a country. Ask any of the other citizens. And I don't mean the democratic republic of Moldavia (which is "MDA"). 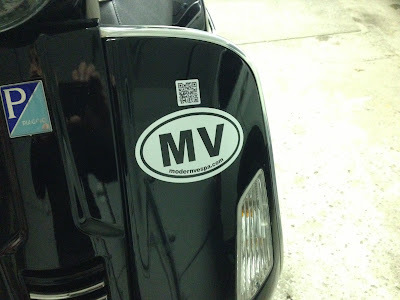 I have an MV sticker on my helmet too. And I have one on my Civic. This time, as I threatened, I have added QR codes linking to the Welcome page of this blog. We'll see if anyone notices and actually comes to the blog from my bike. David, Is this QR code reader an app for an iphone? I would love to have one of those, I would like to create a QR code with my medical info and put it on a card or dog tag. I hate paying companies big moolah to do something that I can do myself. Can you tell me the name of the app? Some people aren't vehicle namers, I happen to be one who does it and not sure why. My gold 1985 VW Westfalia is aptly name GoldZilla and I think that is when the naming of vehicles started for me. I like the idea of the QR code on the bike linking it to your forum - you my dear are ahead of the blogging curve! Dar, to read QR codes on your smart phone you need an app. I have ScanLife. It's free and works just fine. You can generate a QR code free. Most point to a URL put they can be simple text. 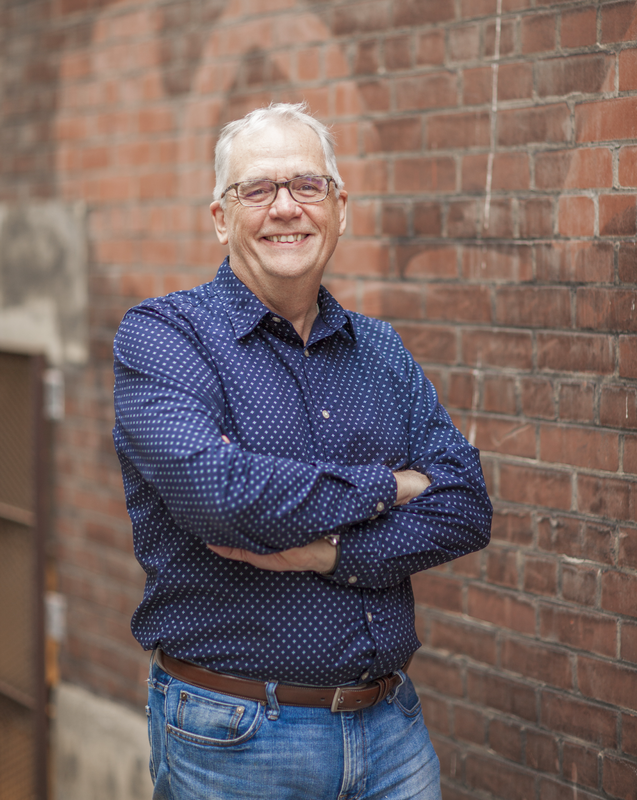 Some free generators limit you to 160 characters. http://www.the-qrcode-generator.com doesn't seem to mind twice that. None of this costs any moolah. You can then go to a vinyl sticker place on the web and get your QR code on vinyl stickers, mugs, picture frames, etc., etc. There is even a page on YouTube where someone did a QR code in needlepoint, cleverly bridging the 19 and 21 centuries. David - Dar might be onto a great idea; in case of emergency just scan my barcode (seems much less evasive than a microchip.) I think I might just look into it. Why did you talk about the QR codes. Now I find myself wanting something that I don't really need... thank the powers that be that it is a freebie. Glad the stickers are all in place. I can sleep now. Karen I agree. A good place for an ICE sticker is the helmet too. It's thanks to Dar that I have ICE on the lockscreen of my iPhone. Sorry Sonja! Nothing is free, this is more of a craft idea. It takes time... and time is money, no? Keith, I appreciate the humour!! Short, punchy, made me laugh! Ride safely. I'm still not commuting, trying to sort things out. Soon though. I haven't named any cars or trucks I've owned but a few bikes have managed to name themselves. I'll be interested to know if anyone comes to the blog from your stickers. Tobairitz, you can be sure that I'll put up a post if that ever happens. I give it about the same chance as a message in a bottle. And yet every now and then, you read about some bottle making its way to a distant shore and the senders being contacted. ScootCommute's Believe it, or Not!